Christmas is coming, and Frannie and Larry Shoemaker are not happy. Their children and grandchildren won't be coming.Their son is taking his wife and kids to Disneyland instead. Their daughter is headed to skiing in Switzerland with the current guy in her life, and promises, in lieu of the usual week at Christmas, a weekend near the end of January. The Ferraros are similarly bereft of visiting offspring, and they all decide that, instead of sitting at home without their offspring, they'll hook up the campers and go visit Larry and Jane Anne's other brother and his family in Texas. To get there, though, they have to travel through Missouri, where they get snowed in at a campground by a rogue storm. 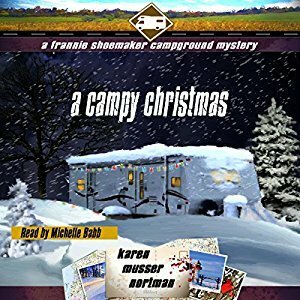 There are no dead bodies or kidnappings this time, but Frannie and friends still find a mystery to solve: a homeless man who tells them to call him JC, and the dog he's been hanging out with. This is just an enjoyable visit with old friends, a holiday trip that turns into a lot of fun in ways they never expected.